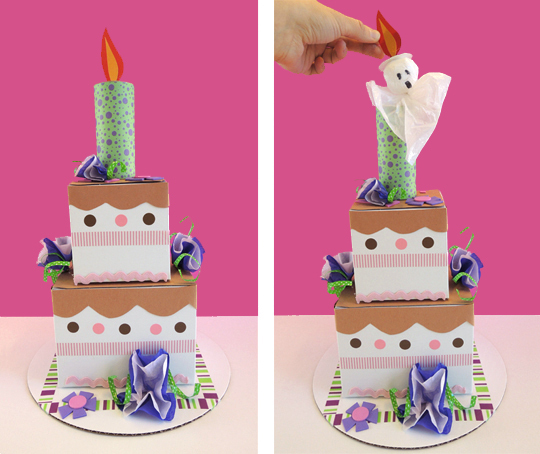 It’s a scrumptious birthday cake, but be warned…this cake is haunted. Pull the flame on the candle and out pops a ghost! We read The Bake Shop Ghost, written by Jacqueline Ogburn and illustrated by Marjorie A. Priceman (Houghton Mifflin, 2005). Miss Cora Lee Merriweather’s cakes and pies might be sweet, but her personality is downright dour. After she dies, she haunts her bake shop, chasing off potential successors one by one. But she finally meets her match when Annie Washington moves in. Annie’s determined to not be scared by loud noises, poltergeist activity, or ghostly heads rising up through her baking table. She confronts Cora Lee and they make a wager. If Annie can make a cake that brings tears to Cora Lee’s eye, a cake “like one I might have baked, but that no one ever made for me,” Cora Lee will stop haunting the bake shop. Annie tries everything. Moon cake, white cake, tiramisu, fruit cake, cheesecake, carrot cake. Nothing works. Finally, after some research at the local library, Annie makes a… birthday cake. The ghost is so touched that Annie remembered her birthday, she sheds a tear and loses the wager. But Annie, knowing a world-class baker when she sees one, invites the ghost to become her business partner. The two bakers make fabulous baked goods together. And every year, they make birthday cakes for one another. 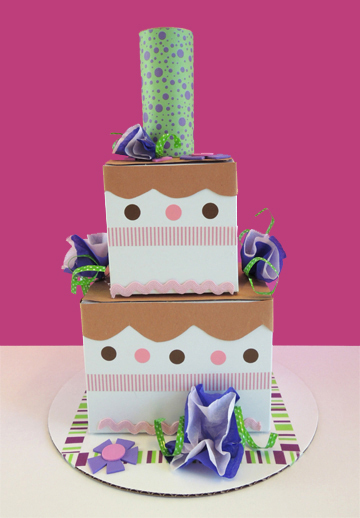 You can use 1 box and create a single layer cake, or you can use 2 boxes and go for a double layer cake. I used white craft boxes, but tissue boxes work too. 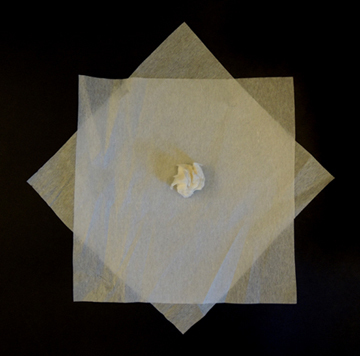 You might, however, want to cover the tissue boxes with white, brown, or yellow, construction paper before you begin. 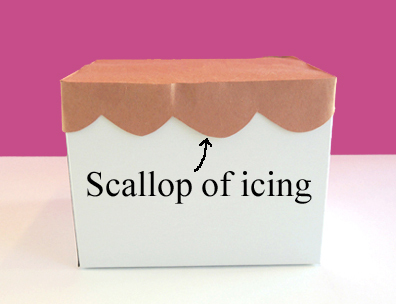 Cover the tops of the boxes with construction paper “icing.” Cut bumps into a strip of construction paper, and wrap the strip around the box to create a scallop of icing along the cake’s edge. It’s time to decorate! We used construction paper, patterned tape, tissue paper squares, craft ties, self-adhesive foam shapes, dot stickers, and rickrack ribbon. I take no credit for the masterpiece you see below. 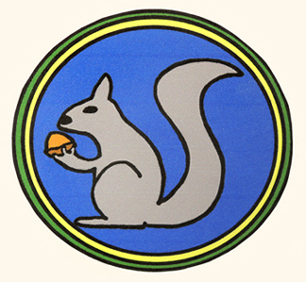 This is the work of Miriam Jankiewicz, a rare books staffer who was helping me out that day. 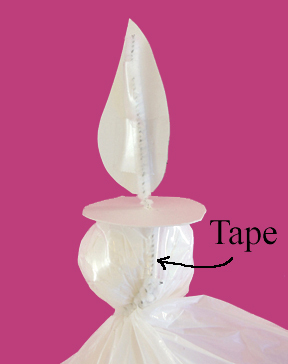 I love the tissue flowers with the delicate little craft tie curls! The cake is complete, now for the ghost! 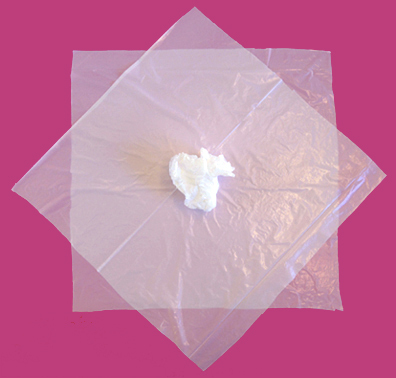 Place 2 squares of white plastic trash bag flat on top of one another. Crumble a third square and place it in the center of the flat squares. Bunch the flat squares around the crumble and twist to create the ghost’s head and neck. 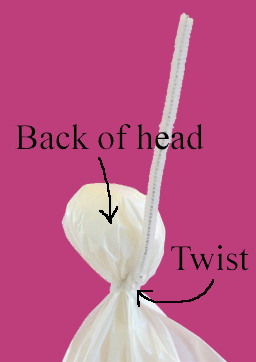 Wrap one end of a short pipe cleaner around the ghost’s neck and twist tightly. Bend the rest of the pipe cleaner straight up. The twist and the straight part of the pipe cleaner should both be located behind your ghost’s head. Thread the free end of the pipe cleaner through the slit in the poster board circle. The circle will rest on top of your ghost’s head like a hat. The final step is to tape the back of the ghost’s head to the pipe cleaner. 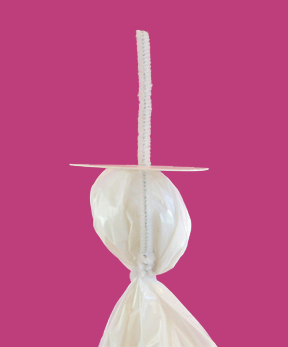 This will keep it nice and steady when you yank it from the cake. 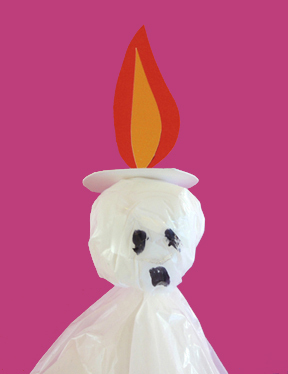 To operate your ghost cake, stuff the ghost into the toilet paper tube candle. Wedge the poster board circle into the top of the tube (you might have to trim it a little to get it just right). Present your cake to an unsuspecting individual, then grab the candle flame and pull the ghost out. Shouting “Boo!” is optional, but entirely appropriate. Looking for a few more spooky ideas? 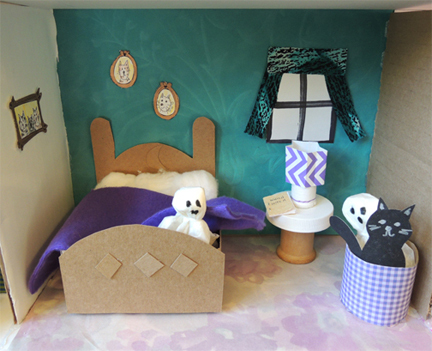 Take a look at our haunted dollhouse, glowing skeleton marionette, creepy carrots, shadow puppets, bat mini-exhibit, mummy in a pyramid, and Spooky Old Tree. 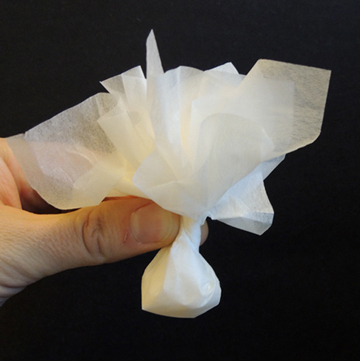 And don’t miss this plump and perfectly simple toilet paper jack-o’-lantern! What do you do when your dream house is haunted? Call in a professional ghost remover of course! 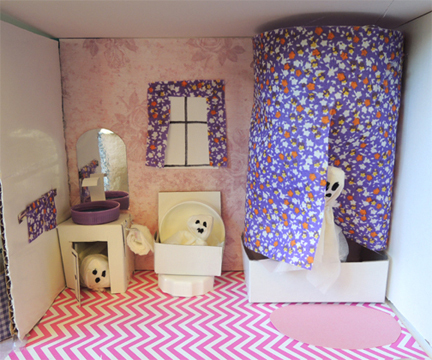 We decorated a ghost box, whipped up 4 tissue paper ghosts, and then went a-ghost huntin’ in this custom 4-story cardboard house. 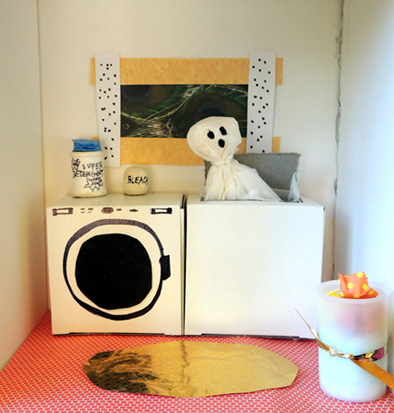 I hid each kid’s ghosts in various locations in the dollhouse and then invited him/her to find them and tuck them back in his/her ghost box! We read Ghosts in the House by Kazuno Kohara (Square Fish reprint edition, 2010). A girl (and her cat) move into a new house but…oh my…the house is haunted by ghosts! The girl, however, happens to be a witch and quickly begins catching the ghosts. After a spin in the washing machine, the ghosts happily become curtains, tablecloths, and cozy blankets. This book was in the holiday section of my local library but it’s so sweet and fun, it really should be read year-round! 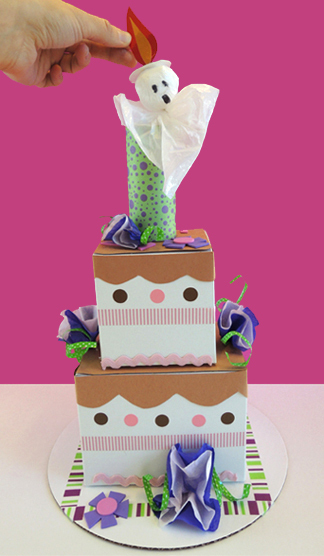 Box decorating materials – I offered embossed foil paper, patterned paper, construction paper (blue, black, gray, purple, orange, pink), mirror board, small feathers, fabric leaves, white 6″ doilies, foil star stickers, and fabric flowers. 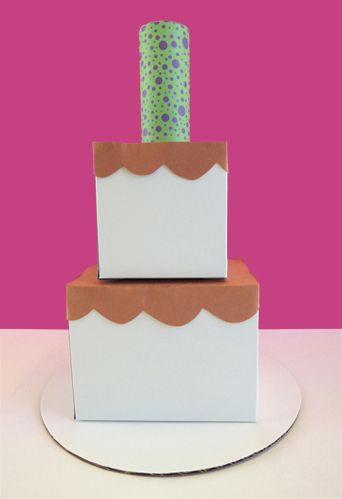 If you’re using a patterned tissue box, you might want to cover it with construction paper or paint first. Then use brown (or color) masking tape to create lines on the outside of the box. 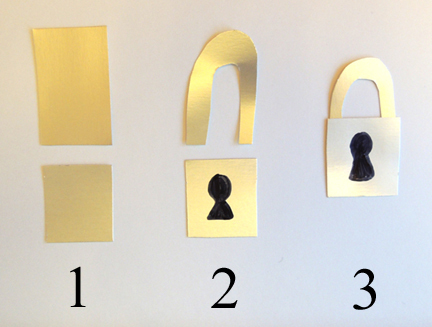 To make a padlock, cut a rectangle of mirror board into an upside-down U shape. 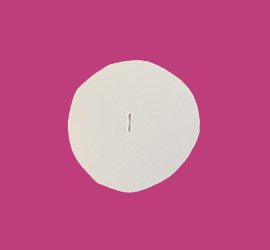 Use a black permanent marker to draw a keyhole on a square piece of mirror board. Hot glue (or tape) the U shape to the back of the keyhole square. 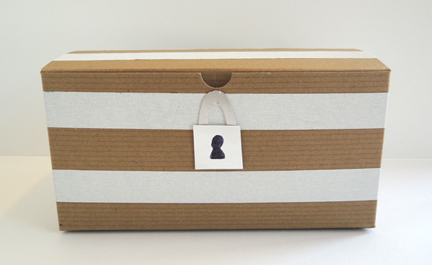 Attach the padlock to the front of the box with hot glue (or tape). The exterior of the box is finished, now for the interior! 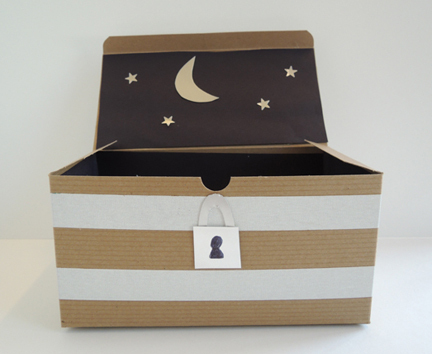 I decided to go for a classic “night sky inside a box” for my ghosts. I lined the inside of the box with black construction paper, added foil stars, and finished the look with a crescent moon. 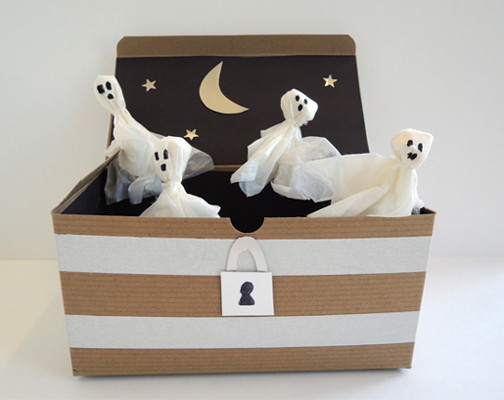 Some kids replicated this look, but others used embossed foil paper, patterned paper, small feathers, fabric leaves, white 6″ doilies, and fabric flowers to whip up some amazing ghost domiciles. 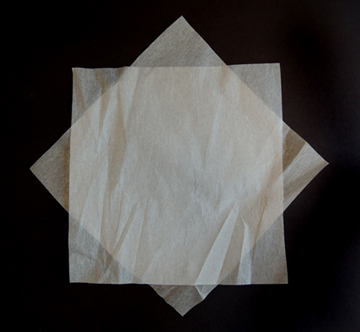 Then crumple a third tissue square and place it in the middle of the flat squares. 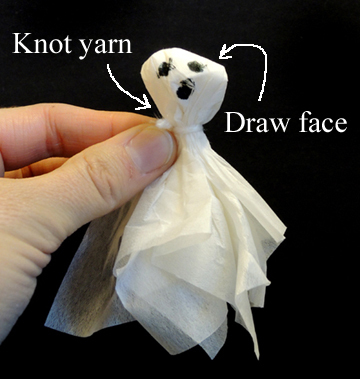 Flip the tissue bunch over and knot a piece of yarn around it to created your ghost’s neck. Trim off any excess yarn and use marker to draw a face. Repeat these steps until you have 4 ghosts. You have a box, you have ghosts, now for the house! 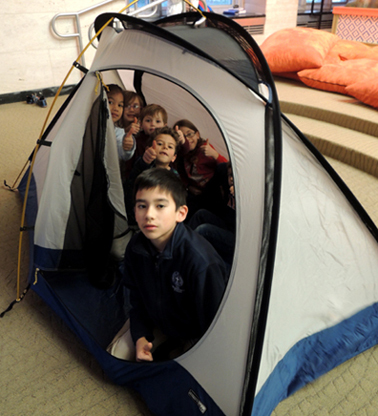 If you’d like to keep it super simple, hide the ghosts in different locations in a room, classroom, or library. 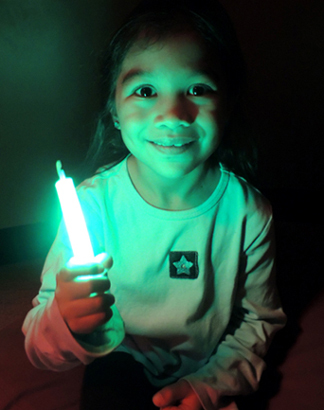 You could even turn off the lights and use a flashlight for an extra spooky ghost hunt. 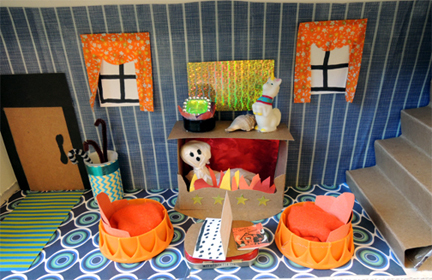 However, if you’d like recreate our ghost house, read on! My colleagues in Firestone Library know to call me if they’re about to dispose of any large or unusually shaped boxes (you can read more about our library-wide recycling program here). 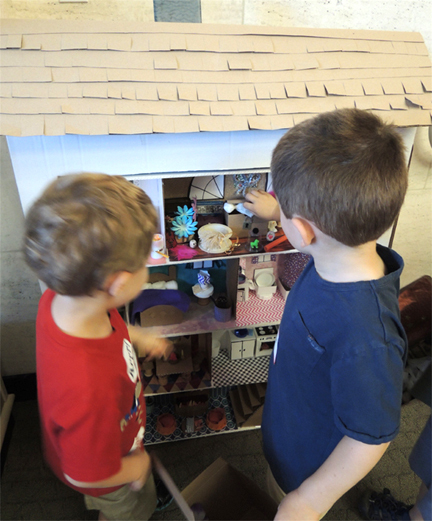 So this dollhouse began as a tall, 6″ x 33″ x 41″ box. 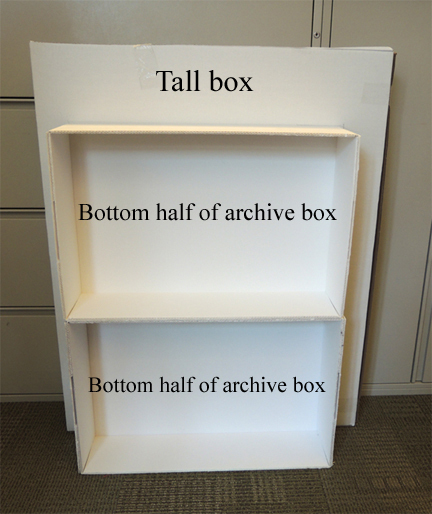 I also had a couple old archive boxes to use up (you can see more of them in action in this post and this post). 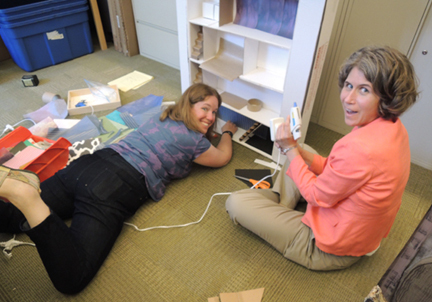 First, Katie and I measured where the stacked archive boxes hit the tall box, and then cut a big hole in the tall box for the archive boxes to slide into. 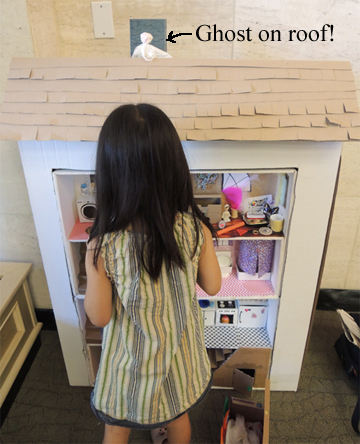 The leftover cardboard was used to make the roof (to which I added some tagboard shingles and a cardboard chimney). 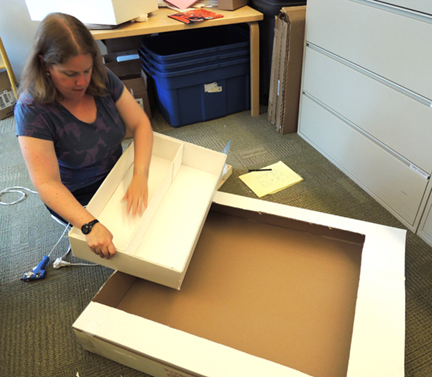 Next, we sliced one of the archive box’s lids in half and hot glued the halves inside the two archive boxes. This created four “floors” in our ghost house. We finished by hot gluing the archive boxes inside the tall box, and added a few pieces of packing tape for good measure. 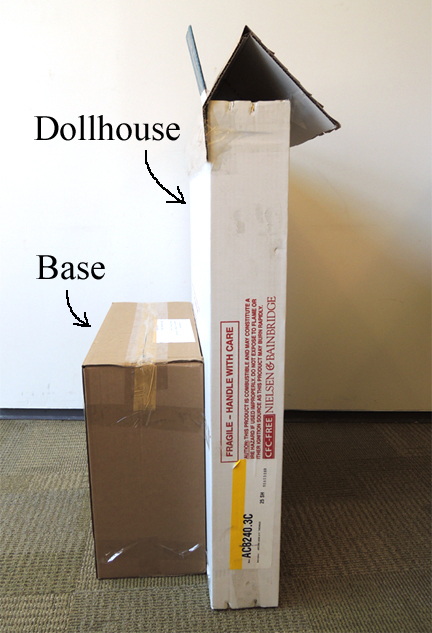 To keep the house upright and sturdy, we hot glued a 5.5″ x 17″ x 25.5″ box to the back as a base. We reinforced the connection with lots of packing tape too. We knew it was going to get bumped and bashed by the ghost hunters! 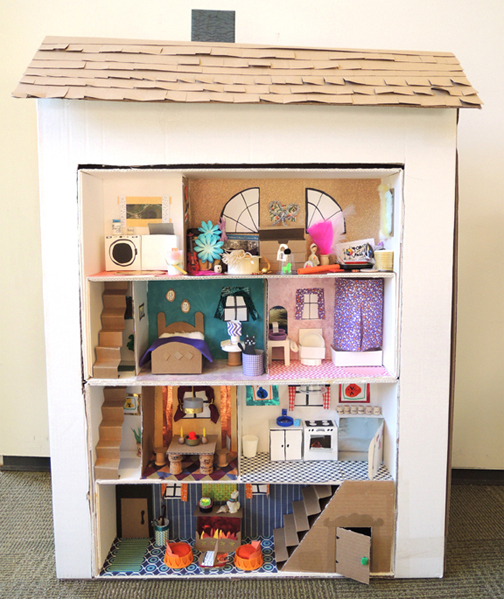 Next, Katie used pieces of corrugated cardboard to create the walls that divided the rooms, and tagboard to make the staircases. You can see the whole thing evolving here. And this is only the beginning of the mess we made that day. Oh yes it is. With the basic elements in place, we decorated the interior. For hours and hours. Katie’s son even stopped by at the end of the day to get in on the fun (my favorites are the laptop in the living room and the Angry Birds artwork in the kitchen). But rather than go into excruciating decorating details, here are photos of the different rooms of the house, as well as some ghosts demonstrating various hiding places. 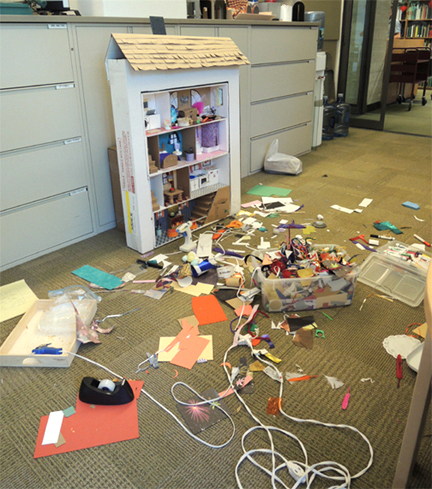 And here is a photo of the tremendous mess we made during the building of the ghost house. Oh yeah. 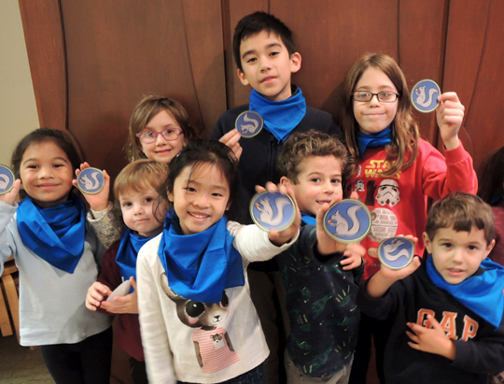 During story time, kids could play the ghost hunting game as many times as they liked. I came up with some pretty creative new places to hide ghosts (like the overhead light fixture in the kitchen, and the roof). 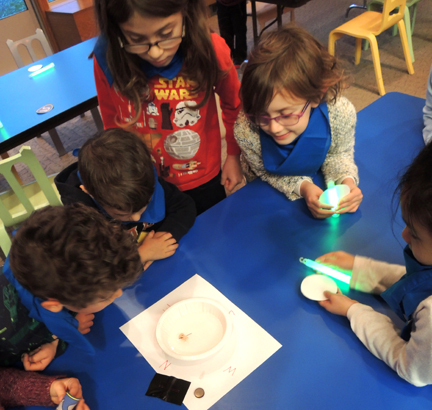 At the very end of story time, interested parties put their names in a hat and the winner took home the ghost house! If, however, you’re still yearning for more dollhouses and miniatures, mosey on over here to see some truly spectacular Harry Potter creations.